Based near Andover in Wiltshire, Rebecca creates beautiful drawings and sculptures which hold strength, movement and elegance at their core. Her own line of work explores the strength and courage of women in situations where they are culturally or socially stigmatised. Rebecca is especially interested in the notion of what it means to feel empowered for women who are born into more challenging environments, and of the concept of Physis: "the determination to grow and survive", for women and girls across the world facing social and environmental hardship. Rebecca’s distinctive line of charcoal drawings have developed over the last 12 years. Time spent travelling and working in Nepal and India has given her an unbending respect for the women who live there. Inspired by their elegance, strength and humility in the face of social and environmental hardship, she has sought to pay homage to them through her drawings. Drawing from her minds eye, Rebecca aims to capture their sense of movement and the unmistakable “feel” of what it is to see these ethereal paragons in their surroundings. 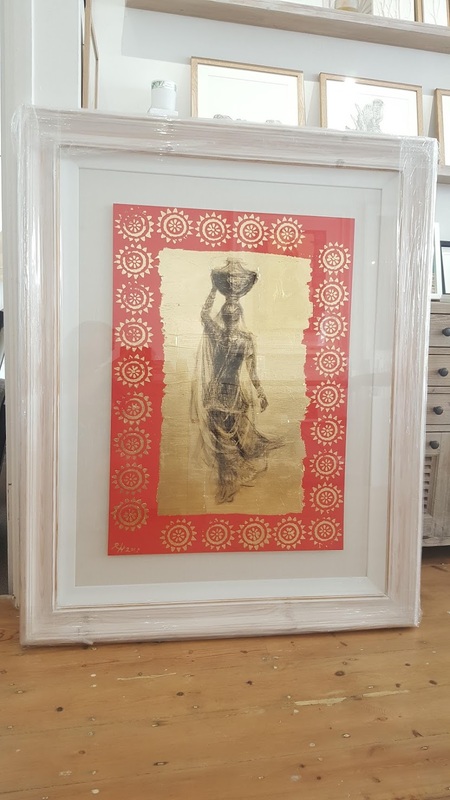 Gradually over the years she has started to introduce the use of gold leaf, and cultural references in the form of block printing found in their saris, into her drawings. Using a technique she has developed, she draws on gold leaf to build beautiful and unusual drawings which pay homage to the women who evolve from within them. Rebecca’s emphasis on traditional skills while incorporating beautifully crafted imagery is building a reputation with private and public collectors alike, both in the UK and abroad. Rebecca has worked on a number of humanitarian projects, including working with the Esther Benjamins Trust in 2009 in Nepal, setting up a sculpture workshop to provide therapy through the art of making to victims of child trafficking.